Shirley Corriher is one of the funniest people I have ever met. I look forward to seeing what she will come up with each year at the IACP conference to entertain all of us. She also happens to be a brilliant chemist and has spent much of her life studying why ingredients behave the way they do when we cook them. Two cookbooks I recommend that everyone have in their library are by Shirley, Cookwise and Bakewise. If you ever wondered what went wrong with the layer cake you just made or if your beef stew came out watery instead of thick and rich, Shirley has the reason and well-tested recipes to help you become an expert in the kitchen. Whenever I am stumped or want to understand a technique more in depth, I turn to Shirley’s cookbooks. When I heard that today’s theme for Food Network’s #ComfortFoodFeast was biscuits, I started shaking in my boots. Biscuits are one of the biggest challenges for a cook, especially when you are baking gluten-free. So I took a deep breath, hitched up my britches and went into the kitchen to brave the demon. When I was at the IACP conference in Portland, Oregon, I had the honor of watching Shirley make these biscuits in person. It was one of those life-changing moments – if it was a movie, the spotlight would have hit me and the rest of the room would have gone dark as the realization dawned on my face. Biscuit dough doesn’t have to be thick and heavy, it can be so moist and light that it barely holds its shape! As I watched Shirley’s beautiful hands, so sure and confident as they deftly formed the dough into rough balls, patting off the excess flour and setting them one after the other into greased baking pans, I couldn’t wait to taste one. And sure enough, they were the lightest, tenderest and by far best biscuits I had ever eaten. I stepped away confident that I could replicate her technique. And I did exactly that … until I was diagnosed gluten-intolerant and could no longer bake with wheat flour. 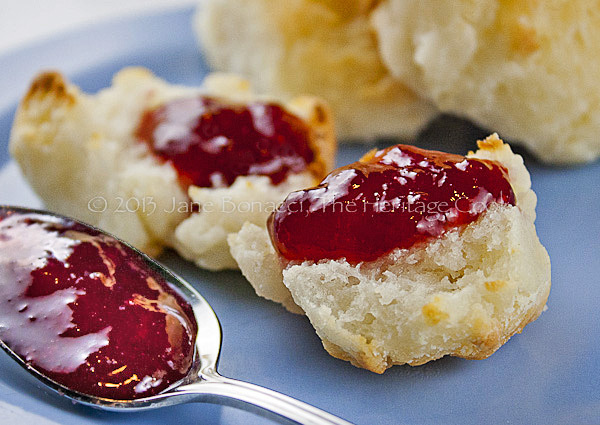 Traditional biscuits depend on a number of tricks to garner rave reviews. The style of flour you use and the type of wheat it was ground from as well as very little handling will help reduce the gluten and produce feather-light biscuits. But when you enter the murky world of gluten-free baking, the rules change. The flours absorb liquid differently, they react to each other in unusual ways, and often take longer to bake fully. If it takes patience to learn to make traditional biscuits, double that for gluten-free versions. Today was my first day trying to make gluten-free biscuits and though I feel like I am back in kindergarten, I think they turned out pretty well. It was hard to tell if they were cooked all the way through. I pulled them out when they were perfectly golden on top but the centers were still a bit gluey. I split them in half, popped them back in the oven and effectively “toasted” the interiors. Next time I will leave them in the oven a bit longer. The flavor was good but the texture was off. I think with a bit more practice the gluten-free version will be just about as good as the originals I had when Shirley made them. For a savory version, some fresh herbs, chopped green chiles, and maybe some grated cheese will add a lot of flavor and interest. If you do not have to bake gluten-free you deserve to make these biscuits because they are by far the best I have ever had. There are some foods I definitely miss since giving up gluten, and these biscuits are at the top of my list. Now I am getting closer to finding the secret to making them with gluten-free flours and gaining back one of my favorite treats! Just remember the mantra when you are doing gluten-free baking: A sense of humor is priceless and will keep you sane! Now I am heading back to the kitchen to give these another try!! Preheat the oven to 450°F. Spray an 8-inch round cake pan with nonstick spray. In a large bowl, combine 1-1/2 cups of the flour, the soda, salt, and sugar. With your fingers or a pastry cutter, work the shortening into the flour mixture until there are no lumps larger than a small pea. Add the remaining 1 cup of flour onto a plate and flour your hands well. Get a biscuit-sized lump of wet dough and put it into the extra flour. Gently shape the biscuit into a soft round, rolling it in the flour and then carefully shaking off any excess as you move it back and forth between your hands. The dough is so soft it will barely hold its shape. Once you have shaped each biscuit, place it into the prepared cake pan, pushing the biscuits against each other. They will support each other, helping to hold their shape and rise up rather than spread out. Continue shaping the biscuits in this manner using all the dough. Brush the biscuits with the melted butter and place on the oven shelf just above the center. Increase the oven temperature to 475°F and bake 15 to 18 minutes, until lightly browned. Cool a minute or two in the pan. Herbed Buttermilk Biscuits: Stir 2 to 4 tablespoons chopped fresh parsley or mint into the dough just before adding the buttermilk. Shape and bake as usual. Unauthorized use, distribution, and/or duplication of proprietary material on The Heritage Cook without prior approval is prohibited. This includes copying and reprinting content and photographs. If you have any questions or would like permission, I can be contacted via email: theheritagecook (at) comcast (dot) net. Feel free to quote me, just give credit where credit is due, link to the recipe, and please send people to my website, www.theheritagecook.com. Please see the Disclaimers page (under the “About” tab above) for additional details.